10 Questions with Vic features an interview with celebrities from a fan’s perspective with questions that most journalists wouldn’t ask. Melissa Etheridge is on top of the world. Her highly anticipated album, ‘The Medicine Show’ drops on April 12, she goes on tour at the end of March and her namesake cruise takes off on March 31st, on board with dozens of renowned musicians. In July, she headlines San Diego Pride, an event she looks forward to with anticipation and excitement. But this Grammy, Oscar and GLAAD Media Award winner still took time from her busy schedule to talk to me about her exciting projects. Melissa is humble, down-to-earth and very friendly, just as I was told by those who know her well. With multiple hit records, fifteen Grammy Award nominations, two wins, an Oscar, star on the Hollywood Walk of Fame. How do you reflect on your remarkable career? You’re sweet! I’m 57 and when you get to this point, oh wow, I don’t feel any different, you look back and you know what, I got to do a lot of the things that I wanted to do, and there is so much more in front of that I still want to do, and I think that’s the key, is being grateful and having that gratitude, yet looking forward with anticipation. How does it feel and what does it mean to you to be the headliner of San Diego Pride on Sunday, July 14th, especially as we commemorate Stonewall’s 50th anniversary. Oh, you know, it’s my job, it’s what I love to do. That’s going to be so much fun. It means that we are going to have a really, really, really good time. You know, most of my career, I try to remain very kind of neutral, you know I’m gay, but you know I’m not gay, gay gay all the time. It’s just really nice having played at lesbian bars in Long Beach, and down in Southern CA for six years, it’s really nice, it’s like getting back to my people, being able to kinda loosen up, there is a certain gay humor that I can fall into, I can certainly talk in more in detail what the songs are about, it’s really nice to get down with my brothers and sisters and just be in the moment and celebrate how far we have become. You show opens on March 29th in Florida and your new album, The Medicine Show, drops on April 12. Can you tell me a bit about the record and the tour? The album really, I started thinking about it in 2016 when I saw sorta where we were all headed as a collective consciousness and sort of through even internationally where we are all sorta vibrating, I started writing all through 2017, then at the end of 2017 I started getting into the studio and thinking how to put musical thoughts together, it was different that I just walked the journey as it was in front of me, I didn’t feel rushed, I didn’t have any expectation, of this is going to be this huge thing, as it went, I said yeah this sounds good, this feels good, this thought is where I want to be, I just kept following the path as it was lit up in front of me, and I came out in 2019 with this piece of art of thought and emotion and just energy of where we have all been in the last couple of years. Your cruise, Melissa Etheridge Cruise’ is about to embark on March 31st to April 7th. Tell me about the cruise. I leave next, next week this time I will be out on the ocean. It’s really fun. This is my third one. And, they came to me forever and I said no, no, no, I don’t want to go on any cruise, I think it’s silly all this stuff. Then I went on one and went oh my God this is amazing. Not only is it beautiful, but I get to super-serve my fans that really enjoy my music, I’m going to play over seventy different songs on the cruise, I get to go really deep, I get to play my new album people, it’s just seven days of me (laughs), it’s awesome, and there is a lot of great artists, because it’s about music, we got Joan Osborne, Paula Cole, Shawn Colvin, Delta Rae, Dar Williams, and Priscilla Renea, just some really great artists on it. Who are some of your personal heroes? People you admire? Rachel Maddow, I want to go fishing with her. That’s a little bucket-list. I admire Ava DuVernay, she has really taken her calling and stepped up. Any of the Presidential hopefuls intrigued you so far? I’ll take anybody. You know what, I met with Senator Warren, I think she’s an amazing human being, an incredible leader with a brilliant mind and a strong heart. I met Kamala Harris, I think she is a strong and powerful leader with a great sense of justice, could be a great leader you know. I met Corey Booker, I find him strong and smart, they are incredibly intelligent people, I think I met them all except for Kirsten Gillibrand, I don’t think I met her. They’ve been there, they have always been there. It’s something that no matter where I go in the world, it’s a percentage and an ingredient, and I’ve always thought that if people feel like this is a safe place, that coming to my concert, they’re going to find people, they just feel safe being who they are. It’s a part of wherever I go. What are a few of your favorite charities or causes that are near and dead to your heart? I’ve always found that near and dear to my hear are very personal, so you’re going to find Gay & Lesbian charities, you know GLAAD is probably doing some of the greatest work around the globe, and of course HRC. Then I move into the health space, the breast cancer space, I shy away from a lot of the big cancer money machines because I concentrate on the smaller ones. I have a charity called ‘Pink Ribbon Garden Project” which is part of the Libby’s Legacy coming out of Orlando, Florida. It’s a very small organization that gives mammograms to those who can’t afford them in Orlando and other cities. And then we are teaching in places that suffer from food injustice, underprivileged neighborhoods how to actually garden and form a real food supply. And the other one is cannabis. The marijuana, MPP (Marijuana Policy Project), NORML (National Organization for the Reform of Marijuana Laws) and ASA (Americans for Safe Access) the groups that do so much work in Washington to get some for all the injustice that the injustice the drug war has brought on. You are an avid environmentalist. What basic things would you like the public to know about the state of our global environment? I would say, you know, it’s easy to get overwhelmed with how bad it seems, yet the only way out of it is to start, all we have to do is take a moment to acknowledge, yeah, we are part of the earth, we need the earth and everything the earth causes and represents in our air, environment, water, our trees and this whole system that is like a body that we interact with, all we have to do is to understand that we are a part of it. And the minute that happens, we will all have the answers. Because that’s what we will all be looking for. So, I believe that in the next ten years, it will be the absolute priority and it will change, and we will change our earth and sort of the way we think about humankind. I think that’s one of the big changes coming. Aside from promoting the record and the tour, do you have other projects coming up? I’m currently writing the music for a musical version of Mystic Pizza that’s going to be coming out in 2020 or 2021. 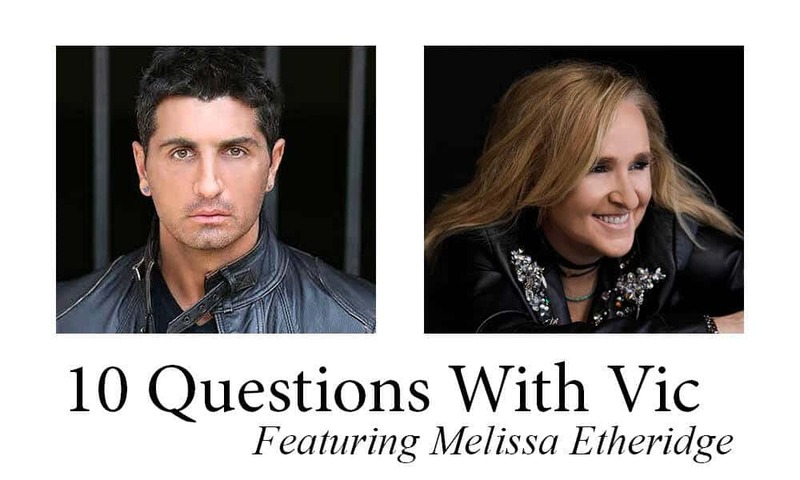 For more information about Melissa Etheridge, including her tour and cruise, please visit MelissaEtheridge.com.